River City Rubbish is contractors’ most trusted source for roll off container rental in Richmond. In our 10 years in business, we’ve learned everything there is to know about construction waste disposal in the Richmond area, including landfill policies, weight limits and local regulations. No job is too big or too small. We provide bulk roll off containers in all standard sizes, from 10 yard dumpsters to 40 yard roll off containers. 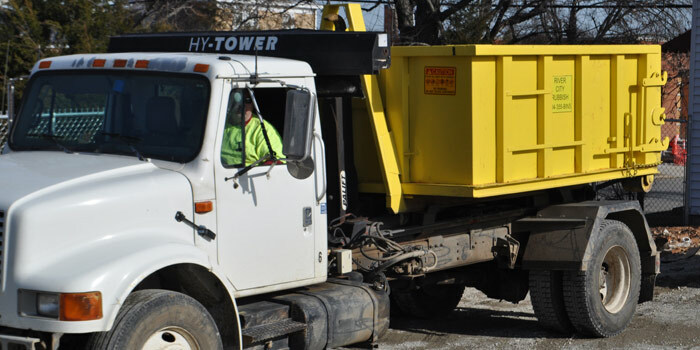 Not only can we handle your construction dumpster rental needs, but we offer complete pre-construction services in Richmond VA. This includes OSHA-compliant portable toilet rentals, fencing, erosion control and traffic barriers. Trust River City Rubbish to check every box so you can get a head start on your project. How does construction dumpster rental work? River City Rubbish makes it easy. Call us and we’ll deliver the right size roll off container(s) for your job. When you’re ready, let us know it’s time to collect your container. We handle container delivery, pickup, hauling and dumping, including all Richmond VA area landfill fees. Call us! Our experts can advise you on the right size for your job and your location. We accept all kinds of construction debris, such as wood, shingles, tiles, fixtures and yard waste. Exceptions include: lead-painted materials, asbestos, paint cans (unless dry), flammable liquids, solvents, chemicals, Freon, batteries and dirt. Because of local landfill regulations, we do not accept household trash (biodegradable/food waste), tires or mattresses. Does River City Rubbish offer LEED certification? Absolutely. If your contract requires LEED certification for waste management, we can help. We offer storage and collection of recyclables, and waste diversion. Why should I choose River City Rubbish for construction dumpster rental in Richmond? Richmond contractors have trusted our expertise for 10 years. We’ve worked with respected local companies such as Burlington Coat Factory, American Family Fitness, Richmond Metropolitan Authority, Chick-fil-A, Target, and many more. We make things easy. River City Rubbish’s construction dumpster rentals include attentive customer service and 10 years of expertise on construction waste disposal in Richmond. You can count on us to take care of everything.